One feature of iOS that has been heavily requested, especially on the iPad, is a guest mode functionality that would work just like on the Mac. Ideally the users would be able to select which apps are available in guest mode and hide or at least password protect them when the device has entered guest mode. This would be useful for when you want to pass your phone around to play games, let other people use them to call their friends, and showcase your latest iPhoneography. There has been ways to do this in the past with various tweaks, but now a new tweak which was just released called GuestMode which will bring guest mode functionality to iOS 7. The tweak functions very simply and the main configuration option for this tweak is deciding which apps the user should have access to when in guest mode. There are also additional per app configurations allowing others, for example, to only access the dialer in the Phone app. iPhoneHacks did a great video review of the upcoming tweak which you can check out below. GuestMode is now available on Cydia in the BigBoss repo for $0.99. Drop us a line in the comments section below on what you think of it. Very useful tool, I’d like to see it actually out very soon. It will hopefully be out tomorrow. and, nice tweak. thank you. I’ll defiantly use this. What is the theme used ?? 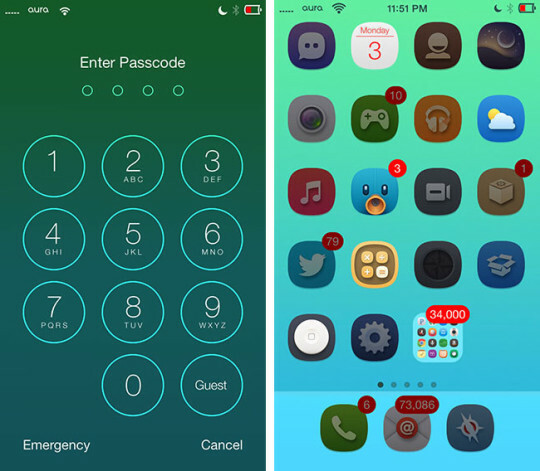 Aura turned out to be a total rip off of another theme though.